Any serious review of modern ERP systems requires you to consider the deployment model. ERP vendors increasingly aim to provide a compelling cloud (or Software as a Service—SaaS) value proposition. Over the last decade, enterprise application consumers have been convinced of the lower total cost of ownership (TCO) of cloud deployment; the benefits of anywhere, anytime access; the freedom of alleviating all the back-end systems management responsibilities; and the opportunity to enjoy instant and worry-free updates and upgrades. Hidden within this cloud promise is a sometimes unspoken tradeoff. 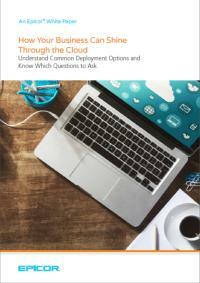 Yes, the technical and business benefits of the cloud are compelling—but at what price? What if your business needs change? Are you comfortable delegating something as strategic as your long-term ERP strategy to a vendor who has its own long-term interests that may conflict with your own?